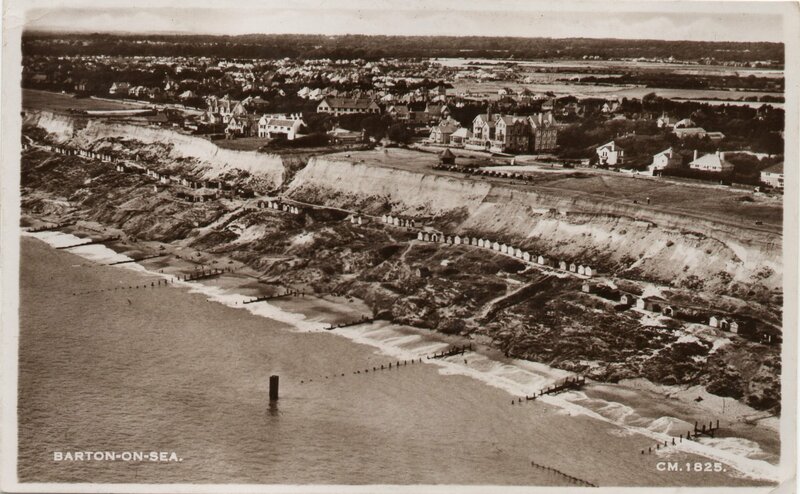 The cliffs at Barton on Sea have a long and interesting history. Originally part of the north shore of the Solent River our cliffs have an international reputation for the fossils found in them. 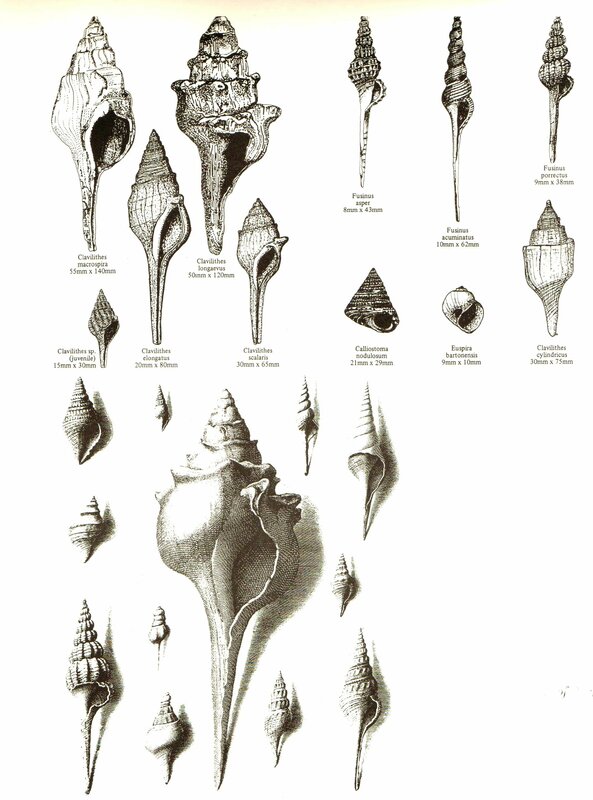 Indeed, Barton has given its name to a particular geological timescale, which is internationally recognised: namely the Bartonian era, which represents all rocks deposited worldwide in the period 41 to 38 million years ago. 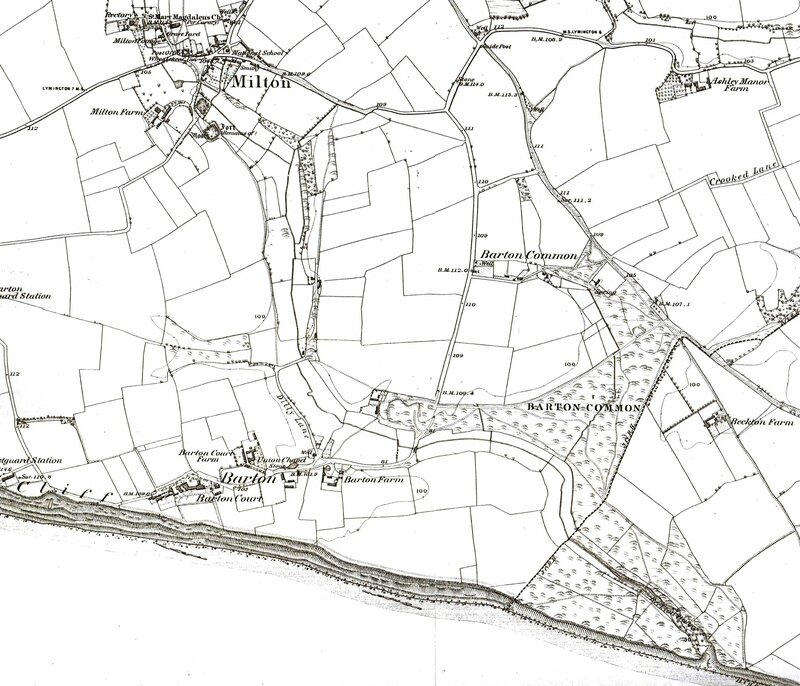 The coast line from Bournemouth through to Southampton Water may look benign now but two hundred years ago it was a sparsely populated and rather lawless place. It was in this area that cross channel smuggling was commonplace. The situation was so bad that a coastguard station was built on the cliff tops in 1823. When that fell victim to the cliff erosion a second one was built inland in 1868 and is still in use as accommodation today. 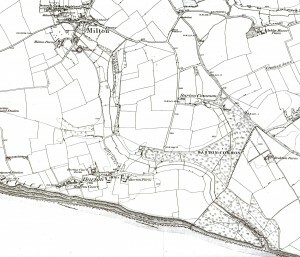 This map is from 1867 and shows the extent of housing and farming at that time. The Barton Court Estate was for many years the main employer in the local area. Later it became a hotel offering luxury accommodation. It is reported that in 1914 the hotel accommodated 250 guests. In August of that year the army commandeered it and took it over in one week. 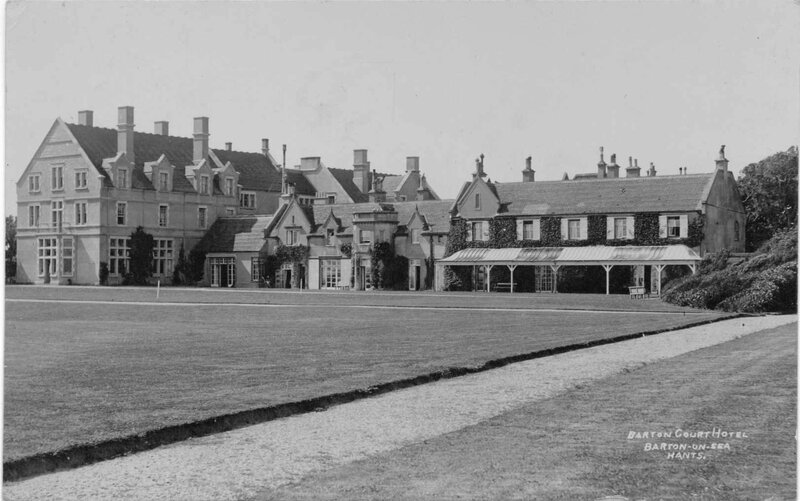 It was used as a convalescent home for recuperating soldiers for the rest of the First World War. Initially the soldier recovering there were Indian later they were British and commonwealth. 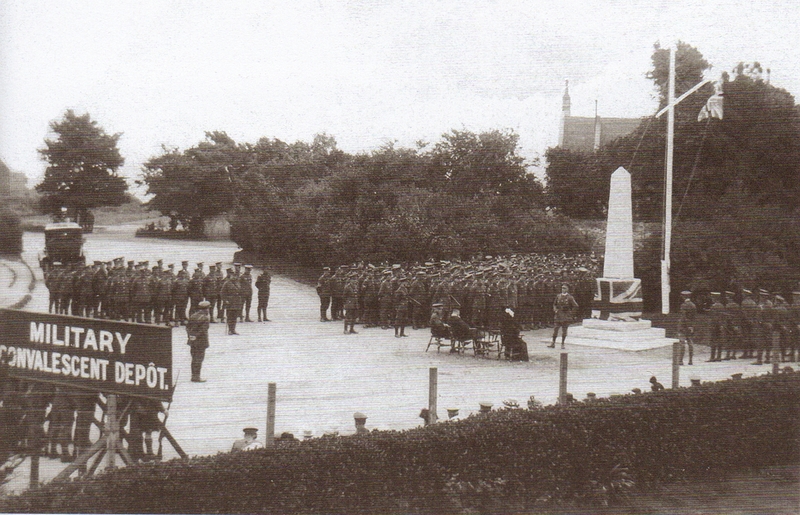 In 1917 a memorial obelisk was unveiled to commemorate the Indian Army convalescent home had been based on the cliffs of Barton. The memorial can still be seen at the top end of Barton Court Avenue. The convalescent camp was quite large and looked after over 25,000 soldiers during the war years. Since the 1890s there has been much housing development in Barton. As the land around Barton Court was sold off to builders . This did not meet with whole hearted approval. The author D.H. Moutray Read, wrote in 1908 “This coastland has been invaded by the speculative builder. Scattered about everywhere are painfully new villas and “desirable marine residences”. Those that are not TO BE SOLD invariably are TO LET! White boards on low posts announce the existence of Avenues or Parks. Two villas make an Avenue and the park probably consists of a double row of seedlings down a loosely gravelled track. Hotels seem to flourish and golf links abound. In the summer holidays visitors fill the little villas and cottages; boys and girls, mostly hatless, career round on cycles; Mr. Brown cuts fids out of the turf, and when his ball accomplishes a wobbly thirty yards jeers at Mr Harris, who has topped his and barely sent it beyond the teeing ground – but their array of clubs is very imposing and the caddies look quite resigned to their fate”. 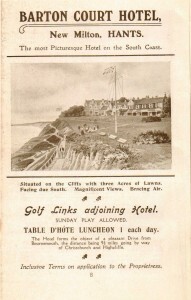 Golf has played a prominent part in the use of the cliff top at Barton. The first golf course, nine holes) was opened in 1897. 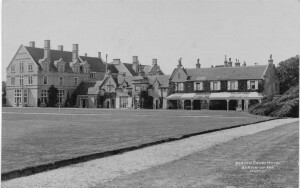 In1910 when a new course was opened, the politician Arthur Balfour (Conservative Prime Minister 1902 to 1905) was present. 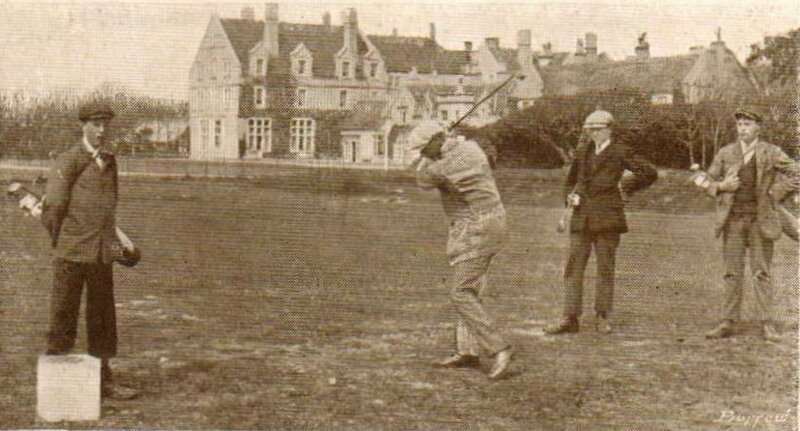 This course was designed by Harry Vardon, one of the top players in the game. These golfers would be out in the sea in 2015 as the cliff edge is very close to the rear of the right hand part of the building seen in the background. Later golf courses were designed further inland to reduce this risk. 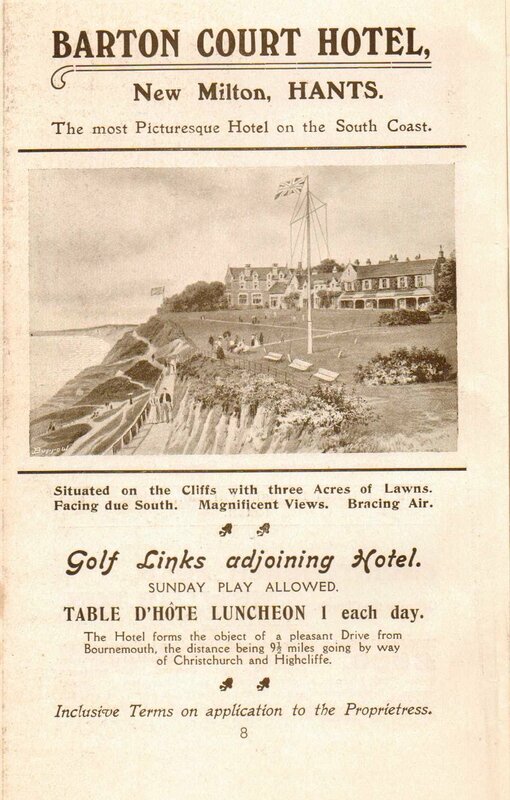 Barton on Sea Golf Club is still thriving over 100 years after the first player teed off. Cliff slippage and cliff toe erosion has been a constant battle along the cliffs and shore line of Barton. The authorities have attempted to protect the cliff toe from erosion by placing rock armour revetments and rock groynes at the see edge to protect the cliff toe from the sea. The cliffs consist of clay, sand and gravel. When ground water seeps between the layers they are able to slide off of each other. The engineering response to this has been to try and install drainage to remove the water before it causes more slippage. 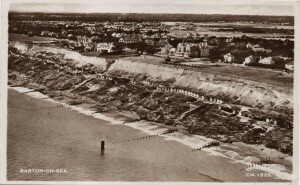 An indication of how much the cliffs have collapsed can be seen by comparing this image (taken in 1992) with the photo for Barton Court which was taken about 1905. The white building in the 1992 photo is on the right side of the black and white photo. Compare this with the image of the golfers. The same wing of the building is in all of the photographs. The breezy cliff tops of Barton are currently used by hang gliders and paragliders. However in 1996 a Cessna aircraft from Bournemouth flying club got into difficulties and made an emergency landing on the grass. After engineers had check the plane one of the flying instructors took off from the cliffs and flew it back to Bournemouth. 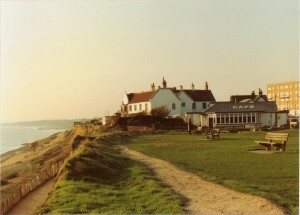 The Café on the cliff top has been a regular feature for many years. It is still going strong today. The path way beside the café, leading down to the beach is known as ‘Fisherman’s Walk’. However for many years it was a straight and steep walk down rather than the more familiar pathway hugging the cliff that we are used to today. This postcard dated 1949 shows the straight path. In the water can be seen a small round tower. This was a diving platform for swimmers to use. In the sea on the right of the photo can be seen the last of the World War Two anti invasion obstacles which had not yet been cleared. Although the cliffs of Barton are slowing sliding into the sea they will give many more years of pleasure to visitors and locals alike.